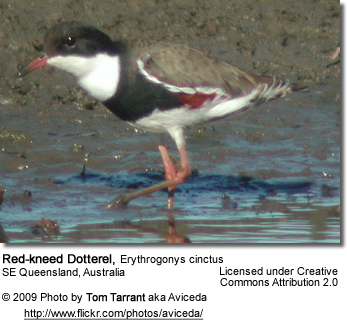 The Red-kneed Dotterel, Erythrogonys cinctus, is a plover in a monotypic (one single species) genus in the subfamily Vanellinae. It is often gregarious and will associate with other waders of its own and different species, even when nesting. It is nomadic and sometimes irruptive. 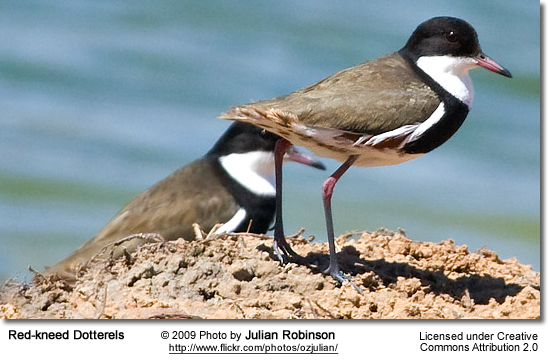 This long-legged, medium-sized plover averages 17-20 cm in length, has a wingspan of 33-38 cm and weighs between 40-55 g.
Adults distinctively marked: Black cap or hood from bill, extending below eyes, merging at nape to grey-brown of back. White chin and throat. Broad black band on breast joining nape and also extending to flanks as chestnut stripe. Belly and vent white. Back and mantle grey-brown, mainly black upperwing with white trailing edge. Upper leg, including tarsal joint or “knee”, red. Bill red with dark tip. Southern New Guinea and mainland Australia; vagrant to Tasmania and New Zealand. Arthropods, mollusks, annelids and seeds. Nests on ground on wetland margins, sometimes using nests of other birds such as Hoary-headed Grebes. Lays clutch of four cream eggs profusely covered with lines, speckles or blotches. Young precocial and nidifugous. With a large range and no evidence of significant population decline, this species’ conservation status is of Least Concern.